Gluten free desserts are now easier to come across at the grocery store and are even easier to make at home by substituting gluten laden ingredients with gluten free versions! Using GF chocolate cookie wafers, I processed them into crumbs and use that as my base for the cheesecake crust. 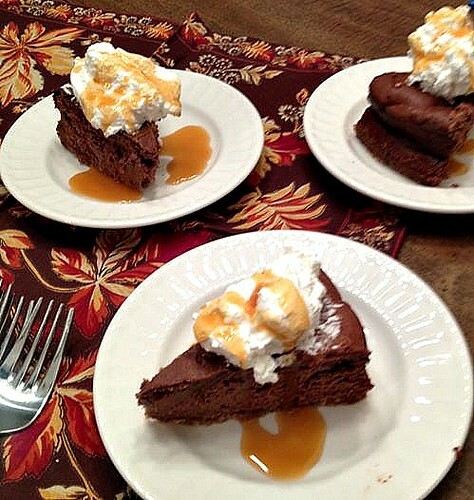 And taking inspiration from Cooking Light, I made a chocolate cheesecake which I swirled a salted caramel sauce into and also served with more salted caramel sauce as a finishing touch. In a medium bowl, combine cookie crumbs, melted butter and sugar. Transfer crust mixture into the bottom of the springform pan, Press crumbs on the bottom and up the sides of the springform pan. In a large bowl or in the bowl of a stand mixer, combine cream cheese and condensed milk thoroughly. Add each egg one at a time, mixing for only a few seconds in between each addition. Stir in 2 tablespoons salted caramel. Transfer cheesecake mixture to the prepared springform pan, filling up to almost the top, leaving about 1/2 inch from the top of the pan - you most likely will have some leftover batter. When the IP beeps after pressure cooking for 35 or 37 minutes (depending on the size of your springform pan), allow your IP to naturally release pressure for 15 minutes if using a 6" springform pan or 17 minutes if using a 7" springform pan.While naturally releasing pressure, the display will reflect numbers counting up from 1. The numbers indicate how many minutes the IP has stopped cooking since it beeped (or how many minutes it has been naturally releasing pressure). No need to touch your IP for this and allow for several minutes to do so. When the display reflects 15 or 17 minutes since the IP has beeped, turn the setting on top of your IP to venting. Doing so allows the IP to quickly release pressure. I use a wooden spoon to carefully turn the setting to avoid close contact with the potential steam. You may also want to turn your IP away from cabinets to allow the released steam to escape freely. The pin at the top of your IP will drop when all pressure has been released and it's safe to open. Remove the cheesecake from the IP. Allow the cheesecake to cool at room temperature for 1 hour while still in springform pan and then transfer cheesecake covered in foil, into the fridge to chill overnight. As the cheesecake cools, it will naturally pull from the sides of the springform pan, making it easy to remove just before serving. 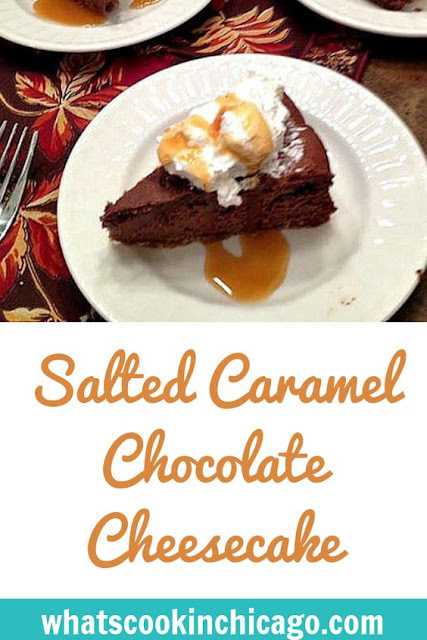 To serve, slice and garnish with salted caramel before serving.